We welcome you to our private slice of paradise at our oceanfront home in the heart of Ocho Rios. 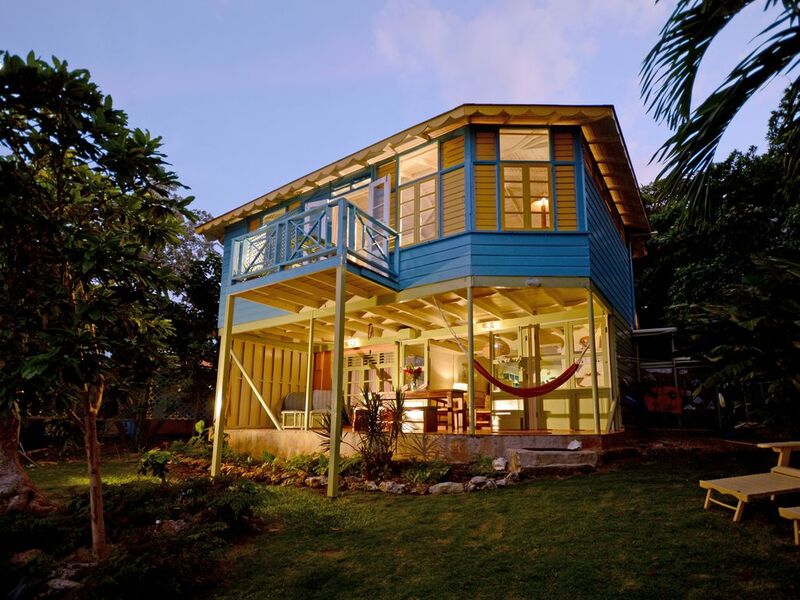 Our lovely seaside cottage provides a bohemian yet cozy vibe for an idyllic getaway. Enjoy mornings on your private garden or bedroom terrace overlooking the sea. The patio offers the perfect place to unwind complete with a sea front hammock and patio. Plan your escape with daily swims, kayaking or paddle boarding all in your front yard. We want you to feel cozy and at home. The cottage has been carefully decorated with a collection of beautiful Jamaican art from our Gallery Harmony Hall. The kitchen is well appointed with everything you would need, and we can also arrange to have a delicious Jamaican meal prepared for you. We also provide all the towels you need to both shower and enjoy the ocean. Jessica owns and lives on property. Our staff is on hand to assist when needed, but let you enjoy your time. We are always available for advice, and to assist in any way that they can so that you too can feel at home. We can arrange onsite massages and if you’d like to venture off property we can make suggestions and help arrange. We have 4 dogs, who are there for all our company and security. They are ever-optimistic, and always want to make friends with our guests. If you have a fear of dogs it is not the ideal place as they greet you as you enter the property. We are nestled on a very quiet and private street in the Ocho Rios. Getting around about town is easy. There are restaurants and grocery stores all within a quick walk.The main part of town is also within walking distance and most activities are just a short cab ride away. I was born and raised in Jamaica and then moved to England for 25 years, working in fashion and textiles. Paris came next before returning home in 2016 to look after the family home and continue my studio practice here. A constantly changing picture of the beautiful sky and sea, and a haven of calm in a bustling town. toilet, shower, This bathroom is upstairs adjoining the bedroom. Shared with owners. We will wash, dry, and iron clothing for you for $10USD per load. Whites will be bleached and washed as a separate load (or half-load) unless otherwise requested. A small garden with grass, chaises longues, rockery, a wooden deck, and steps leading down to the sea. We have a paddle board, a double and a single kayak, with paddles and life jackets. We have masks, snorkels and flippers. I am not sure I can communicate well enough to truly express how felt about our stay at Te Moana. It was one of the best vacations we have had and it is on the list for a return trip at some point in the future. We stayed for a week and enjoyed every minute. Jessica is a great hostess and knows the balance between too much and not enough interaction. She arranged transportation, shopping, local excursions, a catered authentic Jamaican meal, snorkeling and kayak gear, and much more. The sea side cottage has privacy from the rest of the property with direct access to the water. It sits above a protected reef sanctuary, and while there is no beach at the property, as soon as you get into the water there are so many fish a corrals to see that it is an amazing experience. There are lots of places to enjoy the view including the 2nd story bedroom deck, porch, private backyard, sitting deck 20 ft above the sea, and sitting deck that extends over the water at the shore line. There are lots of shade and sun opportunities so you have options on how much sun you want during your stay. The location is only a few blocks off of main street and we took several walks into Ocho Rios for shopping, but when at the property we never felt like we were in a town. It feels like a secluded getaway in the county. We purchased our groceries on the first day and fixed most of our own meals. There is a full kitchen with everything you need. We have been to Hawaii 3 times for vacation and love the beach and snorkeling. This year we choose the Caribbean to reduce the travel time, but not knowing what we would really get. We are glad we tried Te Moana and it will be a hard decision next vacation because while there are differences, the Te Moana vacation was as good as any we have had in Hawaii. Jessica also has someone at the property at all times for security. There is an in-room safe to store your passports and valuables while your there. There is housekeeping available if you want it. The property is very unique and an extremely fun getaway. If you have Jessica arrange transportation from the airport, ask for Troy. He is super friendly and even though they drive a little crazy in Jamaica, he was calm and steady. We have absolutely nothing bad to say. The place was amazing, the location was gorgeous. The hosts were accommodating! A place of peace and beauty. We are so thankful for our short stay at Te Moana. Jessica was such a kind host. She met us when we arrived and made sure all was well upon our exit. This is a truly special place. One of the few places where you have a sense of solitude and unspoiled beauty. Every room of the house has a view of the ocean at all times. What an amazing site to wake up to every morning. Although there is no AC, the ocean breeze and fans kept us cool at night. We were pleasantly surprised that the bugs were not an issue either. There is so much privacy here. I don't imagine there is almost any place like it in Jamaica. The house was created by artists, and has so much character to it. Everything is simple, yet charming and in good condition. The view is outstanding, and the only humans we saw were the occasional fishing boat passing by. When we would go out for a swim we had the ocean to ourselves. While many are concerned about safety on the island, this place felt quite safe. I was worried about not having AC and the general openness of the property. These concerns dissipated after the first evening and were replaced with pure enjoyment. As others have positively commented the written descriptions of the experience are inadequate. It must be lived to fully appreciate. Hope to be back soon!!!! We loved everything about our stay! Jessica is an amazing host! The property is beautiful! And she has awesome staff working for her! Short walk to thre downtown, you get bothered less walking a night! We used shavaun a lot as our driver, he’s a great kid! We loved him! Miss T’s we found was our favorite restaurant! We so loved the privacy and true culture experience you don’t get with a resort! We’d come back for sure!! The Ocho Rios area boasts more attractions than anywhere else in Jamaica, including the world famous Dunn's River Falls. Bob Marley's birth and final resting place can be found at Nine Miles in the hills of St. Ann. Water sports, horseback riding, river tubing, canopy rides, swimming with dolphins, plantation tours, botanical gardens are all here, along with a less traditional ride on a camel.